Prompted by a (now not-so-)recent Twitter conversation I returned to a book I’d skimmed some time ago but hadn’t given the attention it deserves. Chariots for Apollo is the official NASA history of the program up to 1969, published 10 years after the first landing, and reissued by Dover in 2009 (it’s available on Kindle, for all of 77p…). It tells the extraordinary story an endeavour that encompassed 400,000 people and a significant portion of a nation’s income, but delivered a defining moment that — however briefly — united mankind. Many things stand out for me. 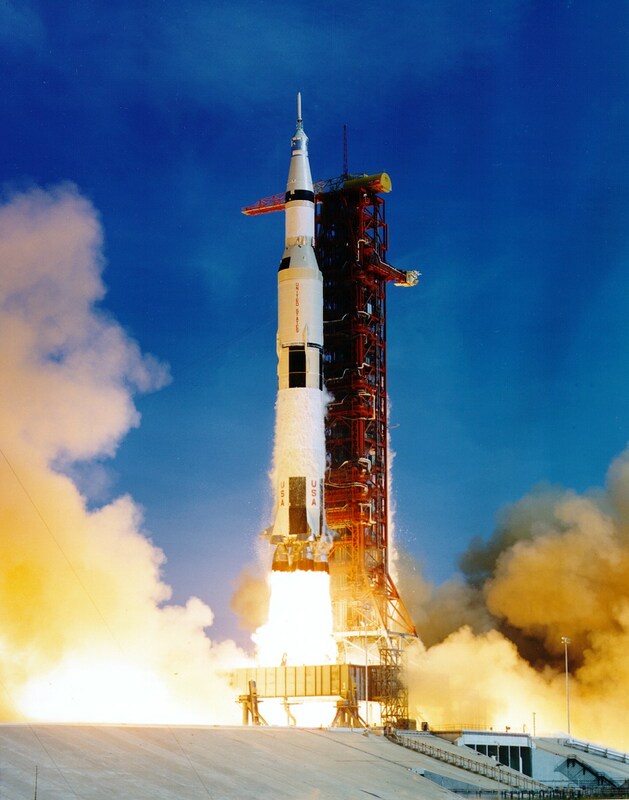 For example, I hadn’t known that the five F1 engines on the Saturn V first stage were tuned (I imagine like vast bells) to different frequencies, to counter feedback effects. More strikingly, we look at the outline of the mission — the two spacecraft, the lander descending to the moon while the command module orbited, the dockings, rendezvous — and think how obvious it all seems (retrospective coherence!). But this mode — Lunar Orbit Rendezvous — was initially discounted as over-complex and dangerous, amongst other things as it called for critical manoeuvres while the craft was behind the moon, out of contact with earth. Two camps formed, one favouring ‘direct ascent’ (a single spacecraft landing on the moon, part of which then returns to earth and re-entry) and one favouring Earth Orbit Rendezvous (several launches would ferry parts of the spacecraft into earth orbit, where it would then be assembled and depart for — once again — a direct approach). Other suggestions were frankly alarming: one involved flying unmanned missions to the moon to deposit fuel and the parts for the return spacecraft, to be assembled automatically, another proposed leaving the astronauts on the moon, and periodically sending them supplies while NASA worked out how to get them back safely (a classic example of fulfilling only part of the requirement). While the story of the astronauts’ dedication and bravery is inspiring, and the engineering is hugely impressive, what’s really amazing is that the goal was achieved at all — hundreds of organisations and bodies were involved, across the entire US, in an era before email (it’s possible, though it’s not clear, that fax was in use - if it was, it won’t have been until the mid-60s, by which time the program was well under way). The story is one of organisation as well as engineering, undertaken by people who — at all levels — were highly experienced in their engineering fields and understood their organisations deeply. It was an age before the proliferation of MBAs and management consultants, and seems gloriously free of external folk telling people how to organize themselves. There was planning, there were deadlines, project managers, program offices, committees, panels, masses of documentation. There were delays, setbacks, quality issues, and one tragic mishap. At each point, people used the organisational tools they had to hand to understand, review and solve problems. It all worked. The lesson for me is that there’s no substitute for purpose and good people who understand what they’re doing. It’s an unpleasant side-effect of the tribalisation of agile that people who ought to know better line up to criticise other project management disciplines in condescending or aggressive ways. Sure, there were and are some shocking examples of waste and stupidity, but in the days before agile (and occasionally since) I’ve been pleased to know and work with some great project managers, and I bristle when (for example) I hear project management referred to as ‘a disease’. And after all, it’s not as if the agile world is without its failures, nor its chancers, charlatans, incompetents. Let’s leave the attack ads to US elections. The business world of today is of course different, and a 10-person startup is not Apollo, but please let’s stop the me-too bashing of a past and present in which good people did, and continue to do, their best. filed under Teams, Organisations on Wednesday, February 26th, 2014.